Golf has become my own personal Endless Summer. The only difference is I’m not in search of big swells in tropical locations, I’m in search of green grass and dry conditions. I’m constantly looking at the weather reports and plotting the best days to play. So, when historic snowfall numbers were predicted in my city, what do you think I did? I got the heck out of dodge and headed to Southern California in search of warmer weather and new courses to play! I imagine what we as golfers go through while fumbling around a new course is something similar to what a musician experiences when they sight read a new piece for the first time. The number of holes on a golf course is always the same, just as the musical notes songs are written with are always the same; however, it is their arrangement that brings them to life and gives them character. A couple of years ago, I had one other opportunity to play a round of golf in the greater Los Angeles area. Based on that experience, I was excited to return and explore the region more extensively. On that occasion, I played Angeles National Golf Club; and, due to its quality and proximity to the Burbank Airport, I knew it would be our first stop on this trip. 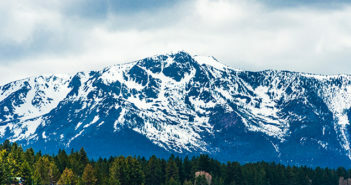 As the snow started to fall in Seattle, WA, a friend and I packed up our clubs, jumped on a plane and headed to greener pastures. The plan was to play 5 rounds in 3 days at up to 5 different courses in and around the San Fernando Valley. No more than an hour outside of Los Angeles, we were smack in the heart of southern California. Situated on the northern side of Los Angeles, the San Fernando Valley is bordered by various mountain ranges like the San Gabriel mountains to the east, the Simi Hills to the west. Even though it rained a couple of times during our stay, I would consider the whole region to have a semi-arid climate. Typically, we saw long grasses, small shrubs, cacti, pines, gum trees and cypress trees. A couple of the courses we played had protected native areas that paralleled fairways and surrounded entire holes, making some decisions off the tee more challenging. However, unless a hole was bordering a road or up against a native area the course layouts tended were wide open and forgiving, which is great for tired swings on the back end of a 36-hole day. 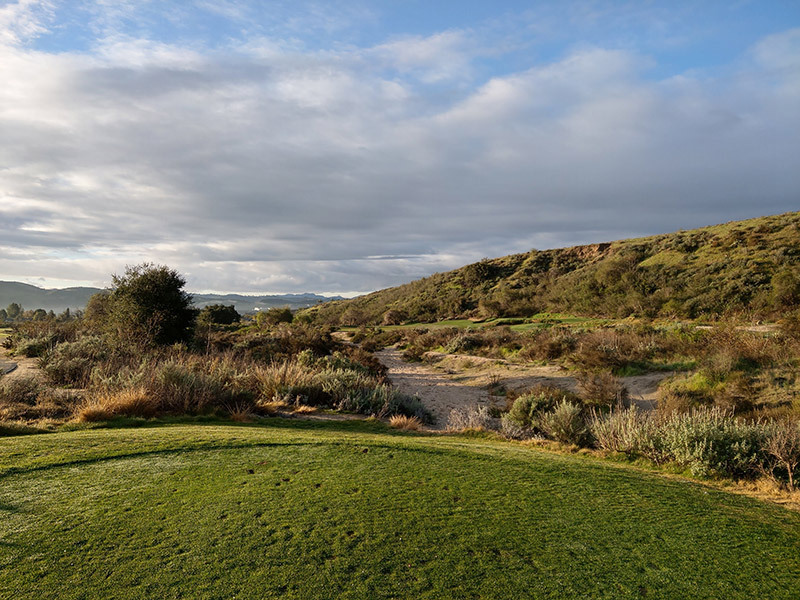 When playing golf in California during the winter months you may find that the grass isn’t always a vibrant green color. It may appear dead, but it isn’t. Grass will in essence go to sleep to conserve water and nutrients in the colder winter months. Grass can also go dormant in the summer months if the region experiences exceptionally high temperatures or a drought. Described as a desert links course, the Nicklaus designed Angeles National is located in Sunland, 8 miles to the northeast of the Bob Hope Airport in Burbank. The course has Tifway Bermuda fairways with bentgrass greens and features 54 bunkers, two lakes and a creek that meanders into play towards the end of the round. The only Nicklaus designed course in Los Angeles county, Angeles National measures 7141 yards in length and boasts a 74.7 course rating and slope of 143 from the back tees. We chose to play from one tee forward, which played almost 6600 yards and still possessed a rating of 72.1 with a slope of 136. What feels like a wide-open course from the outset quickly morphs into a course that demands solid ball striking and accuracy. I’d expect nothing less from Jack after playing a handful of courses designed by the Golden Bear over the past few years. Strategic bunkers protect the greens and often forces approach shots away from the pin in order to keep the ball on the green. There are also quite a few bunkers situated along the fairways to catch wayward balls off the tee. Though, I didn’t find too much issue with the fairway bunkers and was able to advance the ball to a good layup number or attack the green. The greens here are true and quick. The first time I played here I noted how quick they kept the greens. My game wasn’t in the same place then and I had a tough time adjusting to their quickness. Since joining a club in my hometown and playing on a lot of courses with faster greens I found myself much more equipped to handle the speed of their greens. However, it’s the native areas that line these holes above all that really narrows the course’s width. There is not a lot of rough, if any, to slow your ball down from running through the fairway and into the hazards. 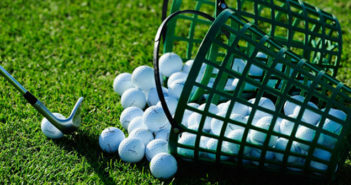 If you are lucky your ball will come to rest in the landscaped bark areas from which you can take advantage of a free drop. We played this course in the afternoon immediately after landing on our first day, where we were treated to the nicest day of our trip. The final stretch of Angeles National heads west, and with the sun setting it provided a beautiful back drop, though it did make tracking our tee shots difficult. 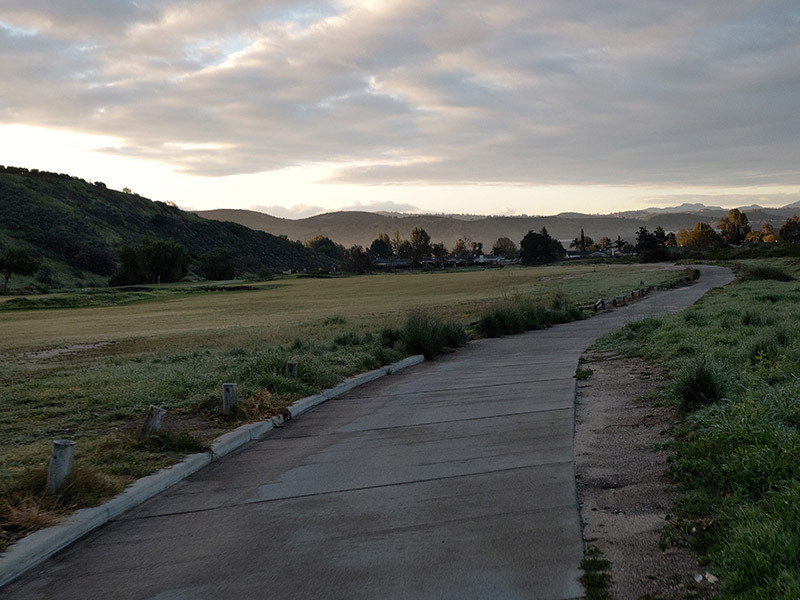 Play this course early in the day and you’ll get the sun coming up over the San Gabriel mountains providing you with scenic views of the foothills and as your round winds through the natural features left undisturbed through the design process. The course flows fairly well, but there are a few larger distances and backtracks when heading from greens to the next tee. They may be mandatory, but if not, take my advice and ride in a cart this round. It’ll help keep up the pace of play. 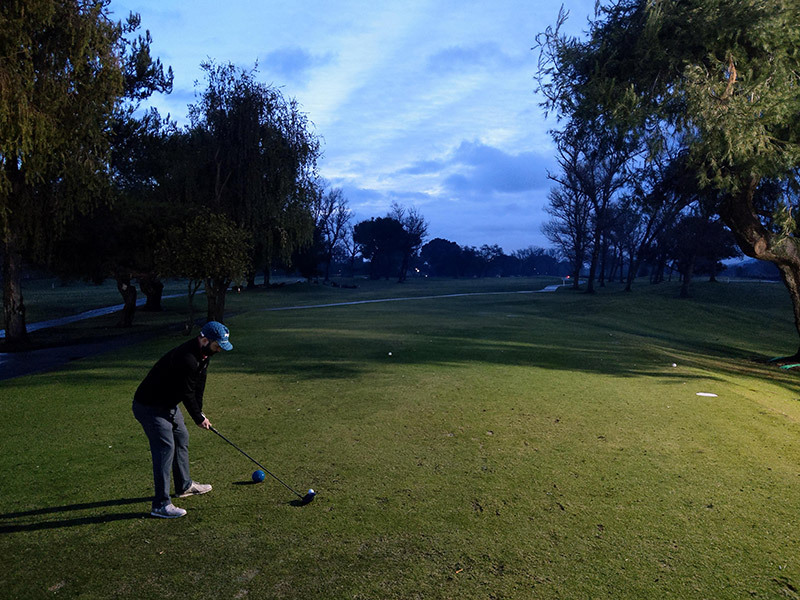 The next morning, we awoke before first light and headed west on Highway 101 towards Thousand Oaks to a little municipal called Westlake Golf Course. I thought playing a smaller municipal course in the region would be fun to see what kind of quality a course geared to the masses would be in. A par 67, and 5000 yards max, Westlake is a little gem. This course is perfect for newer players to the game and people who for whatever reason just don’t hit the ball real far, as well as better players who want to get a lot of practice in with their scoring irons. Under the glow of overhead lights, we teed off into the darkness at 6:20 am. Unsure where our drives landed, we walked forward split out with our eyes peeled. Eventually, we found our tee shots in great position, something that continued throughout much of the round. It was a lot darker that it looks like in this picture. The lights from above the clubhouse are illuminating this shot. For such a small course it had a good amount of character. There were ponds that came into play on a handful of holes and bunkers that guarded many of the greens, but it lacked any true bite. With that said, the greens were in great shape and rolled true. It had rained through the night so the course was a lot more saturated than the dry Angeles National, but I don’t think the all bentgrass course drains as efficiently either. This isn’t necessarily a course I’d recommend you come play the next time you visit the Los Angeles area, but like I said, it was fascinating to check out the foundation of the golf community in the area. Based on this course there is a lot to like about the future prospects of golf in the region. Our afternoon round on the first full day took us to Woodland Hills Country Club. Through connections with our home club we were able to arrange a round at this private course, carved into a canyon on the south end of the San Fernando Valley. A big thank you to the staff and members for a wonderful experience. We were taken care of with the same service they gave to their members. Designed in 1925 by William Bell, Sr. this 6200-yard course follows the natural rises and falls of the canyon. The par-70 is rated 70.7 with a slope of 127 and has 100% Bermuda grass with narrow treelined fairways and fast, sloped greens that break subtly. Treelined courses are not something that scare a player from the Pacific Northwest. In fact, the courses in the Northwest typically feature dense forests with lots of underbrush. Courses like Woodland Hills still give players a chance to get back in play if they find the trees to the left or the right. I found playing on longer, slightly shaggy Bermuda fairways an unexpected challenge. The grass is very sticky and seemed to grab the hosel. I pulled quite a few shots and came up short due to the turf interaction at impact. I’m not sure what it was about this course, but I never really found a groove. It may have been due to the fact that it is a neighborhood country club, and it wasn’t our local club; or perhaps it could have been due to it being target golf at times and a bomber’s paradise at others. Deciding when to go for it and when to play smart was not easy. It appeared that they were working through some updates to the course, so it’d be interesting to return for another shot at Woodland Hills when it is in full bloom. One thing that remained fully operational were the greens. Hitting the center of the green was not enough, you had to be able to hold a shot with check down spin so that your ball didn’t spin off the low side. I found myself victim of this circumstance on the par 4 9th. After leaving my tee shot out right, I still had a shot with a wedge over the top of a tree onto the green. I played safe and stuck my shot into the heart of the putting surface. And then it started to trickle. By the time it ran out of steam it came to rest at the very front of the green and I faced a massive uphill cross-green putt to a back right pin position. A bit of a misread and not enough speed and my first attempt came all the way back down to my feet and I was left to start the process all over again. Ultimately, I ended up with a double bogey on the hole and was left shaking my head at how quickly the course could strike back. Would I come back and play it again? Sure, but there are other courses in the region I’d like to explore before heading back there. During our first couple of days we were paired with other players and had a chance to chat with the people in the pro shops and around the courses, and all of them lit up when we told them we planned to play Rustic Canyon. Located in Moorpark, this links style course opened in 2001 and is a marvel of minimalist design. Architect’s Gil Hanse and Geoff Shackelford wanted to design a course that disturbed the natural surroundings as little as possible. Once again, we got an early jump to the day and had one of the first tee times of the day. 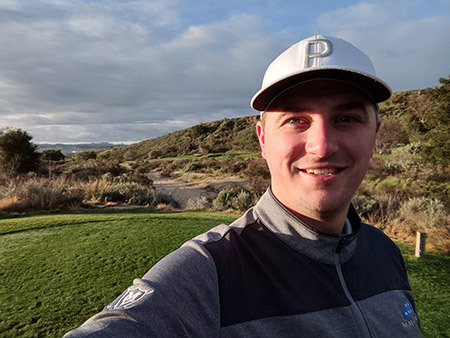 As we arrived at this former sheep ranch converted into a golf course, we both got excited and could see why everyone gushed about this course. Wide-open fairways that link up with other holes gives players multiple route options into a lot of the greens. Closely mown aprons extend 10-15 yards around the greens. You can play the ball in the air or on the ground from many locations around the green. This course had a lot of environmentally protected areas, but it also had a lot of sandy waste areas you can play shots from. These areas were played through the green, which means you are allowed to ground your club and take practice swings. The front nine wanders through a flat lowland, carving holes through the protected natural areas. Large, undulated greens were quick and proper pace was important if you wanted to keep your ball near the hole. The back nine climbs back into the canyon and rises in elevation to reveal views of the whole course and down the valley. This course was so much fun that we decided to forego the potential afternoon round we had booked elsewhere, grabbed a bite to eat, waited out a rain storm and headed back out for a second go at Rustic Canyon. Hands down, Rustic Canyon is majestic. 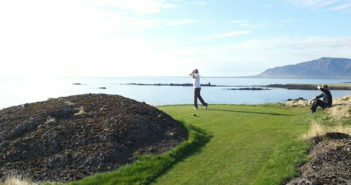 It is a beautiful setting to play golf and depending on the time of year can play incredibly fast. The par 5s take some real decision making, as many times trouble comes into play and there are many areas you can run out through the fairways. Definitely put this one at the top of your list to come play if you are in the area. It might be a little bit of a drive outside of Los Angeles, but trust me, you’ll be glad you took the drive! …Did I mention the historic snowfall at home? Our flight home Sunday evening was canceled, and we were both re-booked onto flights the following day. As my buddy’s flight took off, I was receiving the news that the snow had intensified, and my flight was cancelled again. So, my trip ended up extended an extra couple of days due to the flight cancelations. Since the snow wasn’t letting up, I was going to keep playing. I rented a car and headed back west towards the coast. I didn’t have any tee times scheduled, but being that it was Tuesday I was confident I’d be able to get out without much issue. 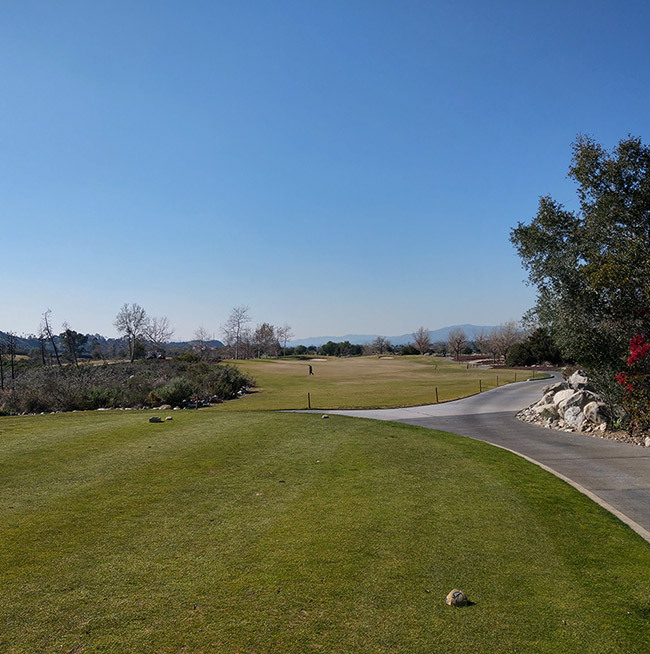 With quite a few intriguing courses out in Ventura county I finally settled on the River Ridge Golf Club in Oxnard because it is a two-course complex. Unsure if I was going to be up for playing two rounds for the third time in four days, I walked in the pro shop a little after 9 am and asked the guy if I only had time to play one of the two courses, which would he recommend? Without hesitation he recommended The Victoria Lakes Course. He explained that due to the recent rain they had received the Victoria Lakes course was just playing a little bit drier and the greens were rolling great. I told him that sounds great and headed straight for the starter. Right away, I liked that the course displays what speed the greens are rolling. That day, they were rolling at a swift 11.5. As I stepped to the tee box on the first hole and met my playing partners for the round I could tell the course fit my eye. The greens fees were almost too reasonable for the courses, they are fantastic! The Victoria Lakes course has hybrid Bermuda fairways and tricky, undulated Poa Annua greens. The course rating is a respectable 72.3 with a slope of 130. As you’d expect, water comes into play on quite a few holes throughout the round, but for the most part the course has a lot of wiggle room. The greens complexes are large. Many of them feature multiple tiers or ridges that separate them into sections, so it is not only important to keep your ball under the hole, but also to find the right region of the green as well. Even thought the course opened in 2008, it has a classic vibe to it. Parts of the course are elevated and open, which leaves them exposed to winds that typically push in off the coast. We finished our round in under 4 hours and I decided to give the Vineyard Course a go as well. A bent and Poa Annua course composition, the Vineyard Course opened in 1986. Once again, I was greeted by a friendly starter who gave me instructions about the course and directions to a couple of the tee boxes that weren’t in sight of the preceding greens. The course had a similar feel to the other one, but it seemed to have a bit more elevation change. The front 9 opens a couple of attackable par 4s before coming to a tricky par 4 followed by a very attackable downhill par 5. However, the Vineyard Course is all about the last 5 holes. Holes 14 through 18 are across the street from the rest of the complex and they are framed by stucco-clad homes. A series of long par 4s winds through the back section, leading up to the 18th. The final hole of the course is an island green par 3. A large, sloped green sits roundly in the center of the small lake and requires a well struck shot to land safely aboard. The greens rolled 9.5 on the Vineyard Course and that’s probably due to its tougher layout. Targets on this course were a little bit smaller and pins could be tucked in difficult to access locations. 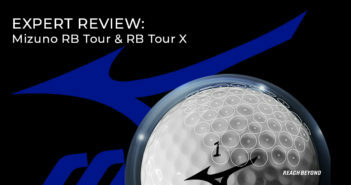 Accuracy was more important than raw power on this course, but length is needed more and more and the round wanes. I had an absolute blast avoiding the snow at home and getting more than my fair share of golf on this trip. 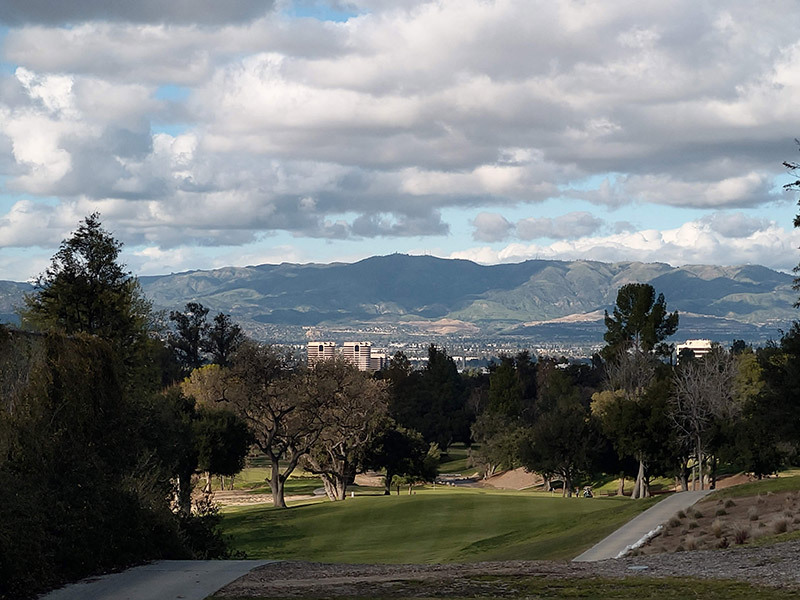 The San Fernando Valley and Ventura county boast a plethora of courses and a climate that allows people to play all year round. In addition to their vast list of public courses, the region also features quite a few private clubs, including the famed Sherwood Country Club. Great food, nightlife and hundreds of entertainment options are a stone’s throw away in Los Angeles. We chose to stay close to the courses we were playing in the morning and found the room prices seemed more affordable the further away from the Los Angeles city limits we got. My advice is to fly into Burbank Airport whenever you fly into the Los Angeles area. It is a much smaller airport than LAX and a lot easier to navigate. The weather will change depending on the time of year you head to the area, but you can expect to experience temperatures between the 50s in winter and the 90s in summer. Home to one of America’s greatest cities, there is no shortage of golf courses to visit or other activities at your disposal in Los Angeles and Ventura counties.